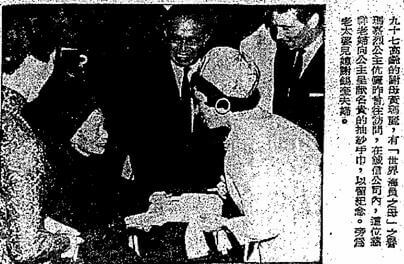 Centenarian Mary Wong presenting a lace handkerchief to Princess Margaret and her then husband the Earl of Snowdon in March 1966 when they visited her shop. Her son and daughter in law Mr & Mrs Jimmy Tse were by her side. Source: Wah Kiu Yat Po, 1966-3-4. York Lo: Mention the Japanese name Oshin, (“Ah Shun” or 阿信 in Cantonese), and most Hong Kongers would recall the female protagonist from the popular 1980s Japanese TV series who succeeded in business and raised a large family against all odds (war, family tragedies, societal prejudices), said to be inspired by the true story of Katsu Wada, the matriarch of the then popular and now defunct Yaohan department store chain. The TV series was so memorable that even a quarter of a century later the discount snack food chain 759 Store picked “House of Oshin” (阿信屋) as its Chinese name to capitalize on its enduring appeal. However, Hong Kong actually had its own version of Oshin, a Chiu Chow widow by the name of Mary Wong Po-lan (黃寶蘭1870-1972) – who was better known internationally (particularly in the sailor community) as “Hong Kong Old Mary” and locally as the “Mother of Sailors”. Starting out as a peddler at the turn of the century to support her three young sons, Mary emerged as a leading purveyor of goods to visiting sailors and tourists in Hong Kong with three retail shops (including the flagship store housed in her very own Mary Building on Peking Road in Tsim Sha Tsui which still stands) and was also a pioneer in the furniture export industry with a factory building on Castle Peak Road. Her many descendants augmented the family fortune by developing and acquiring a large portfolio of properties across the Pacific. She chose Sing Shun (誠信), the Chinese word for “trust” as the name for her company which is reflective of the way she conducted business and it was trust that earned her the admiration from generations of sailors and laid the foundation of her business empire. Mary hailed from Chaoyang county within the Chiu Chow prefecture, was married to a man by the last name of Tse but became a widow in her middle age, leaving her with three young sons to raise on her own. Women in the Chiuchow area were taught how to embroider Western style lace by Baptist missionaries at the turn of the century and the end products (linen, handkerchiefs etc) known as “Swatow lace” (Swatow being the largest city in the area) were very popular in the West, creating a regional industry which at one point generated US$3 million in sales per year and employed over 300,000. To make a living, Mary decided to try her luck in Hong Kong and on her boatride from Swatow to Hong Kong, she successfully sold some of the Swatow lace which she embroidered herself, leading her to a career of peddling Swatow lace. Wearing a simple black dress with samples of Swatow lace in her bag, she started peddling to sailors around the docks of Tsim Sha Tsui, guests in hotels and even foreigners on the Peak and each night returned home to take care of her three young sons. It was Mary’s philosophy to deal fairly with foreigners and one time when she boarded one of the many ships of the American shipping tycoon Captain Robert Dollar (1844-1932) that was docked in Hong Kong harbor, she found a valuable diamond necklace left by a guest. Instead of selling the lost necklace for her own gain, she returned it to the Dollar Line. When Captain Dollar heard the story, he offered to compensate her for her honesty, instead of money she asked for a lifetime pass to board any Dollar Line ships that entered Hong Kong to sell her goods which was promptly granted. This became her golden ticket to success for the decades to come and soon the merchandise she sold expanded to jade, silk, ivory,curios, clothes, food, and other daily supplies and she also provided many value-added services to sailors and visitors including money lending and on occasion even bailing folks out of jail. Allegedly she never lost a cent through her dealing with American seamen as they always paid up the next time they came to port, usually with interest. Canadian-American architect Harry Hussey, who left a mark in Hong Kong by designing the still standing Chinese YMCA Building on Bridges Street (which Robert Dollar helped finance the construction of in 1918) wrote about Mary in his memoir, calling her the “Queen of Hong Kong Harbour”. According to Hussey, Mary was “the banker, post office, purchasing agent and confidential friend of every sailor and every captain, regardless of race or color, who sailed the China Sea”. And he recalled “on arrival in Kowloon I found Hong Kong Mary waiting for me. She knew my name, where I had been, where I was going and when I was to leave for Manila. I thought this was some kind of second sight possessed by the mysterious Chinese until I found that she had boarded the ship with the local pilot when it entered the harbor half an hour earlier and she got all her information from her friends among the crew member.” On another occasion, Mary “met me at the dock, handled my luggage, found a rickshaw for me and bargained for the fare I was to pay so I would not be overcharged”. As she befriended thousands of sailors over the years, she became known internationally as “Hong Kong Mary” (or some sailors affectionaly called her “Ma Ma”) and as she advanced in age “Hong Kong Old Mary”. As business grew, Mary established her own retail shops under the name of “Hong Kong Old Mary Sing Shun Co” which became must-see destinations for visiting sailors. There was a saying in sailor circles that “if you never visited Hong Kong Old Mary, you’ve never been to Hong Kong” and every Christmas her mailbox was full of Christmas cards from sailors all over the world. In 1937, she also started making carved teakwood, rosewood and camphorwood furniture and chests which would become her core business after the War. When the Japanese occupied Hong Kong in 1941, Mary and her family moved inland to Siu Kwan in northern Guangdong province. The War took a significant toll on her business and by 1944, she was running out of cash although hundreds of American sailors across the globe owed her money. In desperation, she sent a letter to the Pacific Marine Firemen’s Union with pictures of the unpaid IOUs enclosed asking for help. The Union submitted the letter to the most popular weekly newspaper in America at the time – the Saturday Evening Post, which in turn published a featured article entitled “The Sad Case of Hong Kong Old Mary” in November 1944 with the opening line “Hong Kong Old Mary wants her money back, please”. Many of her debtors and friends read the article and money came pouring back in which helped her rebuilt her business after the war. In 1951, 250 guests including senior officials of the major shipping lines hosted a party for her 80th birthday. At 80 she weighed 80 pounds but was “still bright of eye and quick of smile”. She also told the reporters that she always wanted to visit America but had never made it as she was “too busy then and too old now”. By this time, although Mary remained involved with the business, she had passed the day to day management to her son Jimmy Tse Sek-fui (謝錫奎) who took the business to new heights. In 1952, he moved the furniture making operations to its own three storey factory building on 495 Castle Peak Road in Lai Chi Kok which Governor Sir Robert Black visited in 1958 and was greeted by Mary and Jimmy. 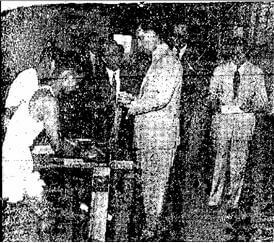 According to the Wah Kiu Yat Po article about the visit, the factory occupied 19,800 square feet at the time and manufactured 150-200 pieces of wooden furniture per day which were exported to the US, Canada and Australia. It employed 80 skilled craftsmen who were paid 10 HK dollars per day and most of the wood was imported from Burma. 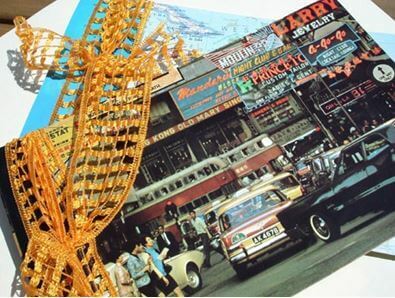 During the 1950s, the Old Mary retail shop was located at 27 Nathan Road until it was re-developed into Alpha House in 1964. There was also a shop at the Chungking Mansions Arcade on 42 Nathan Road. In 1966, the 12 storey Mary Building (Sing Shun Building in Chinese) on 70-77 Peking Road was completed which housed the flagship store on its second floor. Not only sailors and tourists flocked to the Old Mary shops but also visiting royalty – Princess Alexandra in 1961 and Princess Margaret in 1966. As Jimmy had emerged as a community leader in the 1960s, serving as president of the Chiu Chow Association, the Tse Clansmen Association, the Rotary Club of Kowloon West and the Lions Club of Kowloon Central as well as director of the Tung Wah Group of Hospitals in 1962, Mary the centenarian mother was also revered as special guest of honor at many of the related social functions during the decade. In 1969, Mary celebrated her 100th birthday with the Tse Clansmen’s Association and the press. According to the press article while her eyesight and hearing were poor, her mind and speech were still clear and she was able to say thank you and kung hey fat choy in Chiuchow, Cantonese and English. She rose at 7am and slept at 9pm and lived on a healthy diet of fish and congee in a countryside mansion in Castle Peak. On January 21, 1972, Mary passed away at the Hong Kong Sanatorium. According to Chinese customs she was 105 years old but since the Chinese typically add 3 years to a deceased person’s age, she was likely to be 102. She left over 30 grandchildren, greatchildren and great great grandchildren, many of whom had graduated from college some with masters and doctoral degrees. After his mother passed away, Jimmy continued to expand the family fortune through prudent investments in real estate and eventually the family shut down the furniture and retail operations to concentrate on properties and renamed HK Old Mary Sing Shun Company as the Sing Shun Group although one of the family property investment holding companies is still called Old Mary Investments (豪萬利置業) and Mary Building maintains its name in honor of the lady who started it all. In 1972, Jimmy re-developed the factory building on Castle Peak Road into a taller industrial building and later added Sing Shun Building in Yuen Long and the Douvres Building (都富大廈) in Shau Kei Wan in 1988. In the 1970s, Jimmy teamed up with a Berkeley-trained civil engineer Mynin Wong to form T/W Associates to develop and acquire properties in the San Francisco Bay Area. Over time the firm’s portfolio included office buildings and shopping malls, most prominent of which was the historic 10 storey Mercantile Building (also known as the Aronson Building as it was built by Abraham Aronson in 1903) at 700-706 Mission Street, which was acquired from the San Francisco Redevelopment Agency in 1978 and held until 2006 when it was sold to Millennium Partners for US$23 million. Jimmy Tse was a friend of fellow Chiuchow tycoon Ngan Shing-kwan and from 1982 until his death in 1990 at the age of 83, he served as a director of the Ngan family’s China Motor Bus, a position which his fifth son Tse Yiu-wah (謝耀華) also held from 2004 through 2015 and Ngan was also one of his pallbearers at Jimmy’s funeral alongside Liu Chong Hing Bank chairman Liu Lit-man and senior government official Thomas Lee Chun-yon. Yiu-wah continued the family’s legacy of transpacific maritime services having served as the Southeast Asia regional manager for the container line Sea-Land Services. Jimmy had 3 wives who bore him 9 sons and 9 daughters. His descendants continue to add to the family’s property portfolio and acquired the 4 year old Dotcom House at 128 Wellington Street in Central at a court auction in November 2000 for HK$100.5 million. 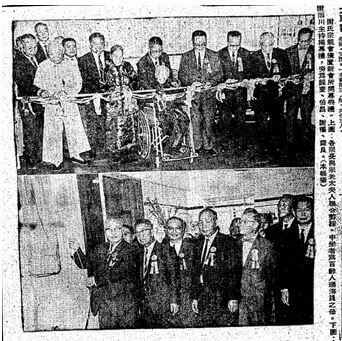 Top picture: Mary Wong (wheelchair bound in the centre) cutting the ribbon at the opening of the Tse Clansmen’s Association clubhouse at 227 Nathan Road (where it is still based) on October 1966. 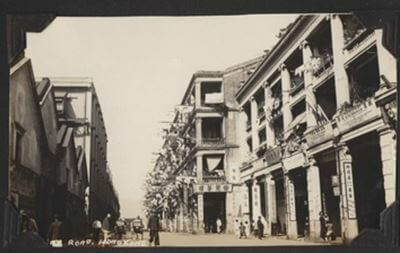 HK Old Mary’s shop (first from the right) in the Hong Kong island side in the 1930s. Mary Building in the late 1960s – the “Hong Kong Old Mary Sing Shun” sign is clearly visible on the second floor. This article was first posted on 6th July 2016. The relationship with the Dollar family extended to the second generation, even after the Dollar family lost control of their shipping empire (renamed American President Lines under new ownership) and Captain Dollar’s son R. Stanley Dollar visited Mary in 1958. It is also possible the “Old” was added to differentiate her from another Mary who was well-known to sailors in Hong Kong at the time – Mary Soo who ran the garbage and side painting concession for all U.S. ships.